Background: Although depression appears to decrease in late life, this could be due to misattribution of depressive symptoms to physical disorders that increase in late life. 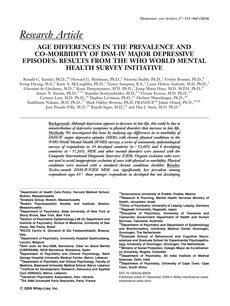 Methods: We investigated this issue by studying age differences in co-morbidity of DSM-IV major depressive episodes (MDE) with chronic physical conditions in the WHO World Mental Health (WMH) surveys, a series of community epidemiological surveys of respondents in 10 developed countries (n=52,485) and 8 developing countries (n=37,265). MDE and other mental disorders were assessed with the Composite International Diagnostic Interview (CIDI). Organic exclusion rules were not used to avoid inappropriate exclusion of cases with physical co-morbidity. Physical conditions were assessed with a standard chronic conditions checklist. Results: Twelve-month DSM-IV/CIDI MDE was significantly less prevalent among respondents ages 65+ than younger respondents in developed but not developing countries. Prevalence of co-morbid mental disorders generally either decreased or remained stable with age, while co-morbidity of MDE with mental disorders generally increased with age. Prevalence of physical conditions, in comparison, generally increased with age, while co-morbidity of MDE with physical conditions generally decreased with age. Depression treatment was lowest among the elderly in developed and developing countries. Conclusions: The weakening associations between MDE and physical conditions with increasing age argue against the suggestion that the low estimated prevalence of MDE among the elderly is due to increased confounding with physical disorders. Future study is needed to investigate processes that might lead to a decreasing impact of physical illness on depression among the elderly.